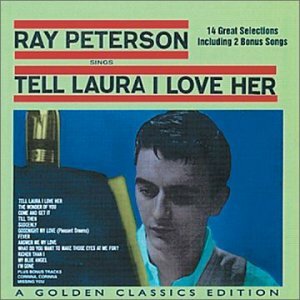 "Tell Laura I Love Her" was my first hit, so Ray will always hold a special place in my heart. I am so glad we had a chance to catch up a couple of years ago - his talent and spirit will be missed by so many. Let me begin by clarifying an important point - "Tell Laura I Love Her" was actually not the first Jeff Barry-composed record to chart. Although "Tell Laura" is widely described as Jeff Barry's first hit, that honor belongs to "Teenage Sonata," released by Sam Cooke more than four months previously, in February 1960. "Teenage Sonata" reached #50 on the U.S. pop charts and peaked at #22 on the R&B charts. I also must mention that I was not named after the heroine of "Tell Laura I Love Her." Nor was she named after me. I was born a year and a half before Jeff Barry composed this tale of teen tragedy with Ben Raleigh in New York City; still a baby in Paterson, New Jersey (just a half-hour bus ride away ... so close and yet so far) when the song was written, I can't claim that I'm the protagonist in the story, any way you look at it. Actually, neither is the fictional Laura. This dubious honor belongs to Tommy, who was so besotted with his girl that he wanted to "give her everything," and to this end he entered a stock-car race and paid the ultimate price for his love. Except that this wasn't the way the story went at first. Jeff observes: "I wrote it originally with Tommy entering a rodeo instead of a stock car race, and getting gored to death by a Brahma bull. My publisher, Arnold Shaw, suggested that not many people would relate to that, so ..."
As Jeff explains, the lyrics were modified, and publisher Shaw brought the song to the attention of producers Hugo (Peretti) and Luigi (Creatore), who gave the song to Ray Peterson, who took the song to the #7 spot on the U.S. charts. Just a few months later, in September 1960, British singer Ricky Valance (not to be confused with Ritchie Valens) brought his version of "Tell Laura" all the way to the top spot of the U.K. charts, and Jeff Barry was well on his way to a career as songwriter (and, later, producer) extraordinaire. Being under two years of age, however, and not yet listening to pop music much less evincing any interest in it, I wasn't familiar with "Tell Laura I Love Her," nor even aware that the song existed until I was in my mid-teens. Curiosity led me to purchase a used copy of the 45; and as the sad words poured out of the speakers of my portable record player, I dissolved into tears. I mourned for Tommy as fiercely as my counterpart in song. Years later, I had the opportunity to question Jeff Barry, rhetorically, as to why the tale of Laura and Tommy had to end so tragically. Couldn't the songwriting team have simply given Tommy amnesia and be done with it? Except that the song would no longer make any lyrical sense. "Tell ... ummmm ... what's her name I love her" just doesn't have the same impact. Copyright 1960 Edward B. Marks Music Company, administered by BMI.